The Zodiac Killer is one of the great unsolved serial killer mysteries of all time. + A mysterious murderer known only as the 'Zodiac'( signed from his taunting letters sent to newspapers), killed five people in San Francisco between 1968 and 1969. The Zodiac Killer’s identity remains unknown and is suspected to have aditional victims dating before and after the late 60’s that have not been confirmed. Only confirmed to be active during the late 1960’s: This December, 1968 killing began a ghoulish series of murders that panicked the people of the San Francisco area. For years the Zodiac taunted the police with weird ciphers, phone calls, insulting and cryptic messages. 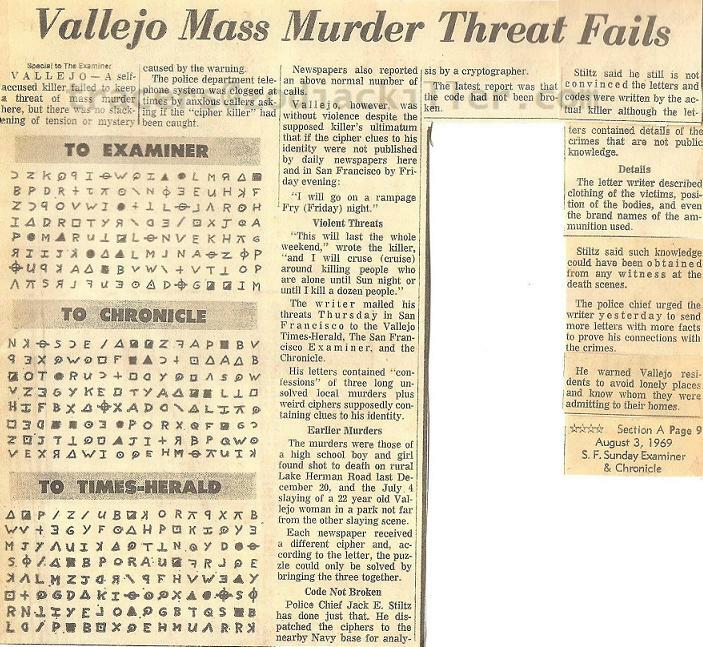 + On August 1 1969, three local newspapers received almost identical letters regarding the shootings: the Vallejo Times-Chronicle, the San Francisco Examiner and the San Francisco Chronicle received near-identical letters from the Zodiac in which he took credit for the murders, proving his guilt by stating several facts about the crime scenes, such as what the victims were wearing, how their bodies were positioned and what brand of ammunition he used. The only signature was the Zodiac's symbol. The letters also contained one part of a three-part cypher designed by the Zodiac, who ordered all three papers to publish the cyphers on their front pages and threatened to go on a killing spree over the weekend of they didn't comply. All three papers published the cypher, which was cracked after a little more than a week by Donald and Betty Harden of Salinas, California. + At first no one could break the ciphers. When the ciphers first came to police attention, Navy cryptographers were asked to attempt to break the code, but with no reported success, including the FBI, but finally a high school teacher in California sat down with his wife over the weekend and broke the code. Working at their kitchen table Donald G. and Bettye J. Harden unlock the secrets of the cyphers. They did it deciding that this guy was so egotistical that the first letter is going to be "I". So he plugged in the "I" all the way through. Next he realizes that the word "kill" is going to be in the code so he looks for double symbols coming after the letter "I". So he then plugs in "L" throughout the code. From there and in short order the code comes apart. The code reveals not the killer's name but his motive for killing. + Donald Gene and Bettye June Harden, cracked the code, except for the last string of 18 letters, on 8 August 1969, a week after the cipher had been sent with the first letters. Their solution was submitted to the Vallejo PD, verified by the Cryptographic Unit at Skaggs Island Naval Communications Center, and published on August 9 by the San Francisco Chronicle and the Vallejo Times-Herald. 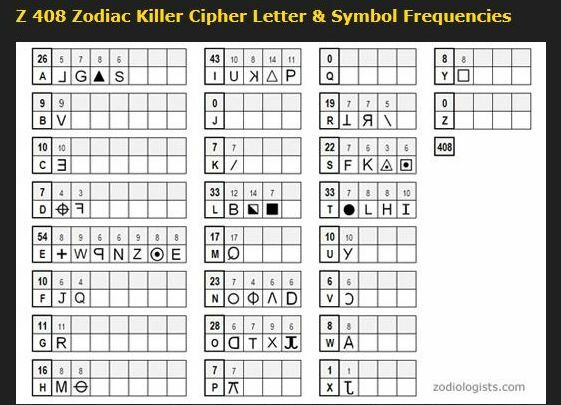 Disappointingly, the cipher did not contain the Zodiac’s identity, as he had promised, but instead, an explanation of why he killed. No names appears in the decoded text, and the killer said that he would not give away his identity because it would slow down or stop his slave collection. "I LIKE KILLING PEOPLE BECAUSE IT IS SO MUCH FUN IT IS MORE FUN THAN KILLING WILD GAME IN THE FORREST BECAUSE MAN IS THE MOST DANGERTUE ANAMAL OF ALL TO KILL SOMETHING GIVES ME THE MOST THRILLING EXPERENCE IT IS EVEN BETTER THAN GETTING YOUR ROCKS OFF WITH A GIRL THE BEST PART OF IT IS THAE WHEN I DIE I WILL BE REBORN IN PARADICE AND ALL THE I HAVE KILLED WILL BECOME MY SLAVES I WILL NOT GIVE YOU MY NAME BECAUSE YOU WILL TRY TO SLOI DOWN OR ATOP MY COLLECTING OF SLAVES FOR MY AFTERLIFE EBEORIETEMETHHPITI." + "FORREST" is probably "Forest". + "DANGERTUE" is probably "Dangerous". + "ANAMAL" is probably "Animal". + "EXPERENCE" is probably " Experience"
+ "THAE" is probably "That"
+ PARADICE" is Probably "Paradise". + "THEI " could be "They" or maybe "Them" but it doesn't make grammatical sense. Might be missing a word like " PEOPLE" and then the sentence would make sense: "The people i have killed will become my slaves ...."
+ "SLOI DOWN OR ATOP MY COLLECTING" is probably "slow down or stop my collecting". And then there is E B E O R I E T E M E T H H P I T I which has not been deciphered into any sensible way. -- Are these mistakes by Zodiac losing his place with his symbols and letters or is it poor cyphering? The other possibility is that the mistakes are just done deliberately to waste peoples time. Here, the order according ZODIOLOGIST . com.HOW ? Of course, the final number changes according to the errors of the zodiac and their order & evaluation. 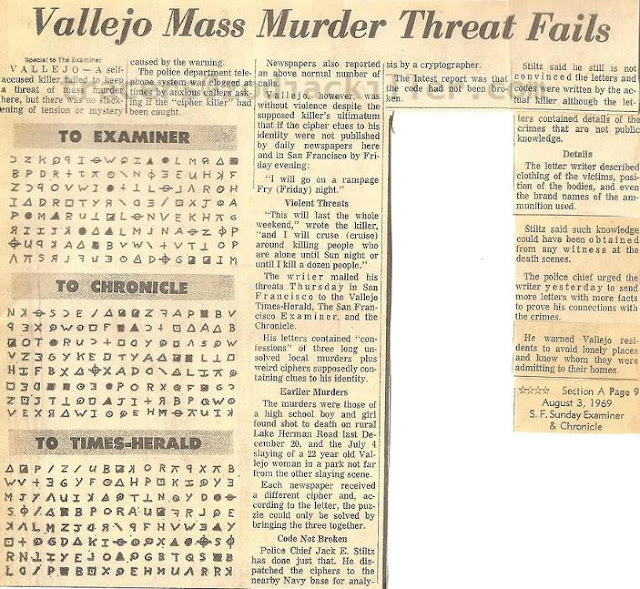 + "A 'Murder Code' Broken"
- A Salinas high school teacher who is an amateur cryptographer said yesterday he has broken the cipher sent to three Bay Area newspapers by someone claiming to have committed three Vallejo murders. - Donald G. Harden, a history and economics teacher at North Salinas High School, saw the cipher, which was reprinted in newspapers, and told The Chronicle yesterday he and his wife had broken it after "about 20 hours of working on it off and on." "As you can see," Harden said, "his spelling is rather poor and in some places he has made errors in the use of his own cipher." - These errors, Harden said, showed in incomprehensible groupings of letters, but the gist of the writer's message was fairly clear. - Harden said the writer tried to make the cipher more difficult by using 12 different symbols for "e," the most commonly used letter in the language. - To further throw cryptoanalysts off the track, Harden said, the writer used a backward "q" 16 times, in an effort to make an analyst think that stood for "e," as, indeed, Harden first thought it did. - Harden said he broke the code by looking for four-letter patterns which would fit in with the word "kill." "We felt that 'kill' would be used more than once," he said. - In the message, the writer used "kill" once, but "killing" twice and "thrilling" and "killed" once each. - Vallejo Police Sergeant John Lynch, in charge of the investigation of the murders and of the cipher letter writer, asked The Chronicle to send Harden's code to him for further checking, which was done. Much more in the links mentioned previously. 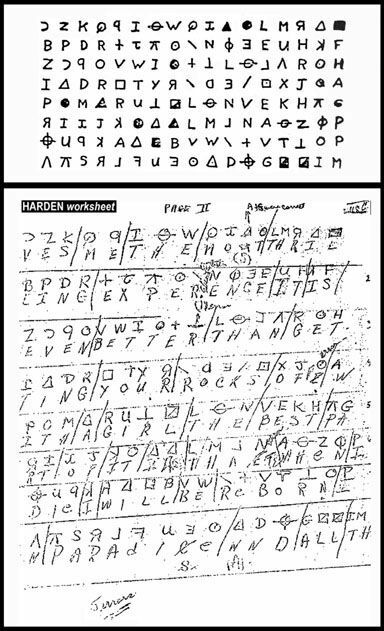 + The Harden’s were successful in deciphering the Zodiac’s cipher because their method relied on the basic facts and common sense. The Hardens assumed that the killer’s ego would dictate that the message began with the word “I,” and, that the killer’s need to brag about his crimes would dictate that the message also included the word “kill.” These assumptions proved correct, and the Harden’s produced a clear and coherent solution which began, “I like killing people because it is so much fun.” Experts confirmed the accuracy of the Harden solution and the deciphered message is generally accepted as valid. The Hardens based their assumption on basic facts about the killer’s letters and they produced a message which contained clear sentences of coherent text. The methods used could be verified and duplicated by others, and, the solution was did not appear forced. Harden worksheet - PART TWO . + Nothing definitive is known about the Zodiac's background since he was never caught. The most prevalent theories that exist, as profiled by John Douglas and other FBI agents, are that the killer may have had a Naval background, and that--due to his uncommon grammar and spelling--may possibly have been British. + In 1969, some 43 years ago, Donald G. and Bettye J. 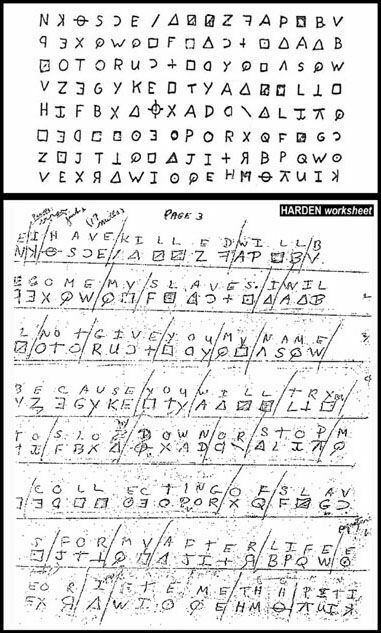 Harden solved the first Zodiac code. Since that time, the three other codes Zodiac sent to the SF Chronicle have remained unsolved. If one takes the Harden solution and general code solving principles and applies them to the unsolved codes, you get a string of letters with no apparent meaning. It seems clear that there is at least one more "step" needed to solve the codes. But what is it? And did Zodiac give us a clue as to what it might be?
" I would like your readers to know that the first code's solution was a collaborative effort on the part of both of my parents. 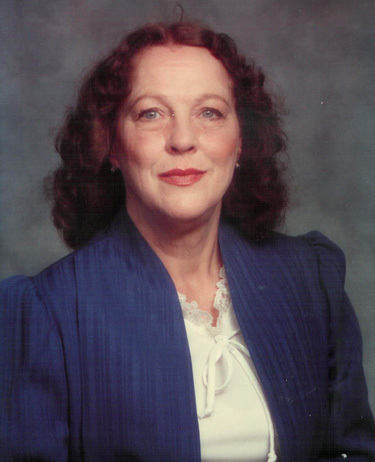 My father (Donald G. Harden) furnished the cryptography techniques and my mother brought her own intensity, zeal and drive to the project. I remember my parents sitting at our dining room table with San Francisco Chronicle folded to the code." " My mother sat at the table working with the odd symbols of the code and became obsessed with it. She sat there until the code was cracked and did not sleep for several days. I remember the conversations between my parents as they worked: my dad expressing doubt about the message, about the syntax; my mother was so sure, so positive. She knew." "........... My mother wrote poetry and was as absorbed in her writing as she became with the Zodiac codes. She worked on the second code on and off for the rest of her life." Much more in the link mentioned previously. "As the Zodiac story continues without end into another new decade, we are reminded that our own time on earth is all too short. I was saddened by the recent news that Donald Harden had died." "On Friday March 23, 2012, another noted figure in the Zodiac mystery passed away. Former Vallejo police dispatcher Nancy Slover (Earp) answered the Zodiac’s call after the shooting at Blue Rock Springs Park on the night of July 4th, 1969. "Much more in the link mentioned previously.
. Computer programmer David Oranchak developed the “Zodiac web toy,” a cryptography website where visitors can use a program designed to test their own solutions. 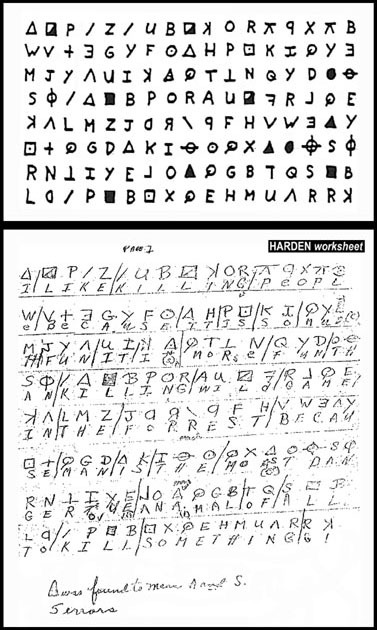 Herbert S. Zim, in his classic introductory cryptography text "Codes and Secret Writing", gives the English letter frequency sequence as "ETAON RISHD LFCMU GYPWB VKJXQ Z", the most common letter pairs as "TH HE AN RE ER IN ON AT ND ST ES EN OF TE ED OR TI HI AS TO", and the most common doubled letters as "LL EE SS OO TT FF RR NN PP CC"
+ "Zodiac" is the name used by two murderers at same time. + The first murderer unknown the art of killing. He just shoots. He is a military man serving in cryptography or military communications (for this reason he did not know how to use a gun despite to be accustomed to use). Is a old man. + The second murderer is accustomed to using knives but he habitually not kills with knives. he is a cook. He talks to his victims and is not sloppy in their deadly work. This is unpleasant for him and so he stole the shirt to the driver (so not to kill again, replacing piece of clothing by murder). + The first two officials murders could not be performed by the second murderer because it would be obvious who has been. The first murderer protects the second murderer. + If you look at the photo of the widower and the drawing made by witnesses of the last official murder of Zodiac then you will know who is the second Zodiac killer. It is all a great deception, a big hoax necessary to hide a murder ordinary. Donald Gene Harden WAS the Zodiac - the message Donald Gene Harden Salinas School Teacher is visible in the 408 cipher.......the letters D and H are hidden in the car and bus drawings of both of the bus bomb diagrams......check YouTubes' Zepplin1968........that guy is the man - he solved it. Only question remains is how many did Donald Gene Harden Murder?